Celebrate National Scrapbook month by getting that scrapbook out of the closet and get started now. Bring your own adhesive and paper cutter and scissors. RSVP BY: May 9th so I can prepare for you. Below is one of the samples you will make. Big Shot Club/Class For those that purchase the big shot from me, you can come to three meetings/classes for Free. Already own a die cut system, you can join the club, attend for $15 each month. We will be featuring a new die each month and you will need to buy a pack of cardstock or designer paper each month. I know you are going to love playing with my favorite new tool as much as I do. Also bring your own big shot and cutting pads that come with it. Email me to reserve your spot. Remember to bring your stampin' tool kit scissors, adhesive, ruler, paper cutter etc. Ask me about getting your own Big Shot. This month we will feature the matchbox die cut. May 18th Mon- 7-9pm Stamp club This is a fun girls night out where you come once a month and stamp together and I will teach you new techniques and use new stamp sets and new tools, plus you get to take turns being the hostess. This month Kellie is our hostess and we will be making projects using the new Circle Scissor Plus Cutter. Send me an email if you would like to join us! May 20th Wed 7-9pm And Many Mower-Masculine Cards Cost: $35.00 This is a fun class which will include the "And Many Mower" stamp set you can view it in the Occasions Mini Catalog on page 8. Cost of set is $27.95 plus shipping and tax. or if you already have that set the class fee if $18.00 bring your own set with you. Please prepay for you class by May 9th so I can have your set ready for you for class. Thank You Card Stamps Great Friend stamp set Paper Baja Breeze card stock Kiwi Kiss card stock Whisper White card stock Ink Basic Gray Classic Stampin' Pad Baja Breeze Classic Stampin' Pad Kiwi Kiss Classic Stampin' Pad Accessories Summer Love Rub-Ons Stampin' Dimensionals Instructions Apply flower Rub-On to Baja Breeze card stock using wooden stick included with Rub-Ons assortment. Adhere to Kiwi Kiss card. Stamp "Thank you" in Basic Gray ink on Whisper White card stock. Apply leaf Rub-On to Whisper White card stock. Adhere to card. Stamp butterfly image in Baja Breeze ink on separate Whisper White card stock. Trim closely. 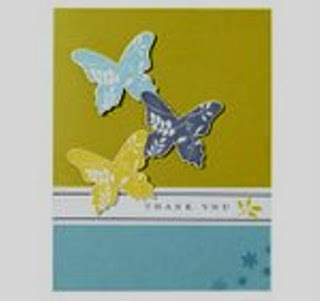 Adhere to card using Stampin' Dimensionals. Repeat step 3 using Basic Gray ink and Kiwi Kiss ink. Big Shot Club/Class April 14th- Tues- 7-9pm For those that purchase the big shot from me, you can come to three meetings/classes for Free. Already own a die cut system, you can join the club, attend for $15 each month. We will be featuring a new die each month and you will need to buy a pack of cardstock or designer paper each month. I know you are going to love playing with my favorite new tool as much as I do. Also bring your own big shot and cutting pads that come with it. Email me to reserve your spot. Remember to bring your stampin' tool kit scissors, adhesive, ruler, paper cutter etc. Ask me about getting your own Big Shot. 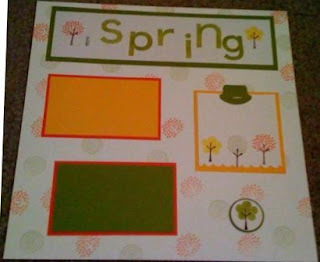 Fifth Ave Floral April 16th- Thurs-7-9pm Cost $15.00 You will make 3 awesome cards with the Fifth Avenue stamp set. We will also use the new Manhattan embossing folder. 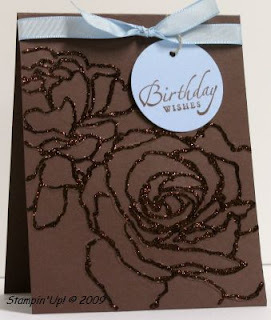 Don't you just love the chocolate Chip tone on tone and the chocolate glitter. This in just one of the cards you will be making. Email me to reserve you spot. Downline Meeting April 19th- Sun- 2-4pm My team meets monthly, when we share ideas and business tips and we always stamp and have a great time together. This month we will be stamping with new catalog stamps and new products. Join my team and join us. Stamp Club April 20th- Mon- 7-9pm This is a fun girls night out where you come once a month and stamp together and I will teach you new techniques and use new stamp sets and new tools, plus you get to take turns being the hostess. This month Ella is our hostess and we will be making spinner cards using the Big Shot. Send me an email if you would like to join us. VIP LUNCHEON April 25th –Sat- 12-2pm We has such a good time in Feb I thought I would offer the VIP luncheon every other month. This is a fun girls out afternoon. You come and eat lunch with me and I have a special project for you to make and door prizes and we just have a fun time. Your ticket to this free lunch is a $150.00 order. You can buy it all for yourself or you can get orders from your family and friends to bring. I will need a RSVP so I know how much food to prepare by April 22nd. Framed Art Mother's Day /friend April 28th- Tues- 7-9pm See sample below on blog. 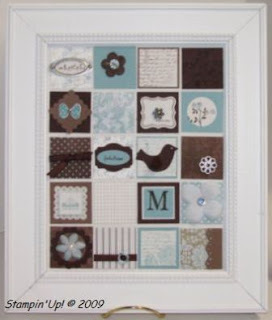 You will furnish your own 8x10 frame and make this beautiful framed art for a great mother's present or for a special friend. Fee $30 by April 23rd so I can have your pieces cut and ready for you. Scrapbooking Crop - Cardmaking Night May 1st Fri- 6:30- 11:00pm St. Andrews United Methodist Church is sponsoring a "Scrapbooking Crop - Cardmaking Night" Fee $15 donation to go to the building fund. Please bring a light snack to share and join us for an evening of fun and fellowship. We will have door prizes, demonstrations and a make and take. To reserve your space by April 26th, please contact Frances Wagner (334-8800 or wagstamp@bellsouth.net). Materials will be provided for the make and take, but participants provide all other supplies they will be working with. We will have punches, paper cutters and a Big Shot dies cut machine that you can use while there. Please bring your favorite adhesive and regular scrapping, stamping tool kit. Good morning, I am so excited about my new blog and want to share some ideas with you that I have been working on. Today I’m sharing a project with you that I did a couple of weekends ago while stamping with a friend. We got the idea from another demonstrator friend, Allison Barber. She saw it in the Fall-Winter 2008 Idea Book and Catalog. These catalogs are wonderful to keep for ideas and inspiration. I love the way this turned out. This would make a great gift for Mother's Day. Check back later for my class list. Welcome to my new blog! I am happy to have a new blog look and will be posting new stamping samples soon and look forward to sharing new techniques, tips and more! To keep updated, be sure to subscribe to my blog! I want to thank Michelle Laycock (http://www.laycockdesigns.com/) for designing my blog banner and Heather Wright-Porto (http://www.blogsbyheather.com/) for setting up my blog. Thanks for visiting!